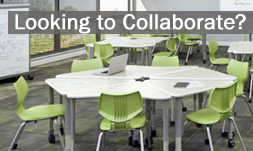 Selecting the right school furniture can be a challenging task, especially when it comes to computer workstations and chairs. With many students taking computer classes, furnishing a school with the appropriate technology furniture is a must. Key features should include comfort, mobility, and flexibility. One size certainly does not fit all when it comes to computer furniture. What is comfortable to the high school football player will not be so accommodating to the varsity cheerleader. With concerns about posture and repetitive motion injuries, ergonomic and comfortable chairs are essential furnishings for computer classes. Accommodating students of different ages and sizes in a computer lab can be accomplished by using furniture that is flexible and adjustable. Tables, chairs, and keyboard trays with adjustable heights allows students to find their comfort levels. Chair backs should be adjustable and have lumbar support, with chair height that allows students to rest their feet flat on the floor. Armrests, if applicable, should also be height adjustable. It’s not just a matter of comfort, but desks should also have a way to manage the enormous amounts of wiring in which the computers, peripherals, and networks are connected. Desks with trays and compartments are available that can sort and conceal wiring. Worthington Direct carries a complete line of computer seating and tables that are appropriate for educational settings. For example, the Duraline Lab Classroom Chair by American Desk is a durable adjustable chair perfect for computer labs. For the younger grades, the Virco Zuma Computer Classroom Youth Chair features a smaller shell and lesser height adjustability. Computer tables and lab furniture such as the Flex Computer Tables by Smith System offer ample workspace to seat students in pairs. Contact us for many more computer chair and desk ideas to suit your technology classroom needs.